Yesterday, my usual city centre car parking facility had been transformed into a pop up vintage fair. Thinking it’d be rude not to look as I was passing through, I stopped for a moment. As I browsed the rails – filled with chunky knit jumpers for £25, leather skirts for £30, faux fur jackets for £70 – I found myself tutting and frowning. When did second hand shopping get so expensive? Maybe I’ve been ruined by car boot sales. Once you’ve scored a leather suitcase for £2, paying £35 for one seems sacrilegious. I’m not adverse to paying a little bit more for something really special, but £25 for a floral dress from 1997 doesn’t sit well with my vintage moral compass. I am bowled over by this beauty. 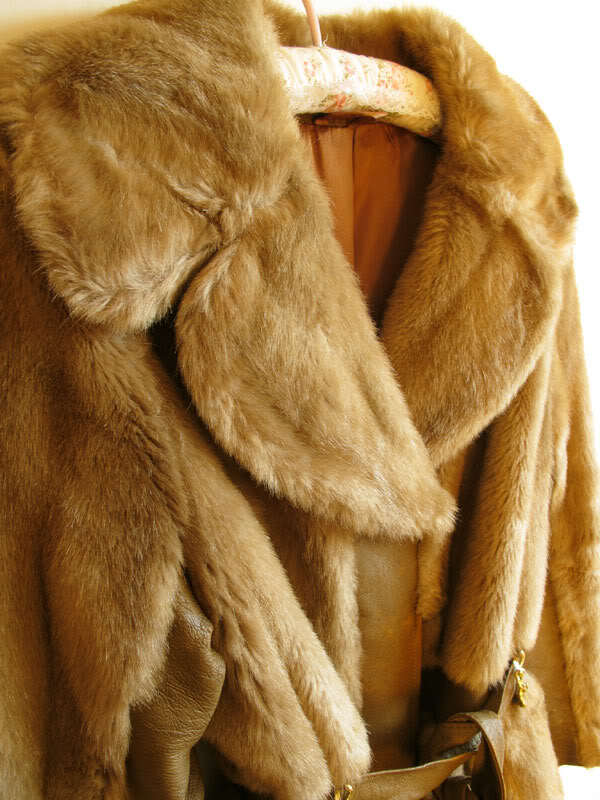 As soon as I spied the faux fur pelt, peeking out from a rack of polyester and fleece, my step quickened. I was over there like a shot, throwing it on my shoulders and waltzing around the North Leeds branch of Mind like Marilyn Monroe (kind of). The leather panels break up the faux fur, making it much more wearable, while the longer length gives it that old Hollywood glamour. 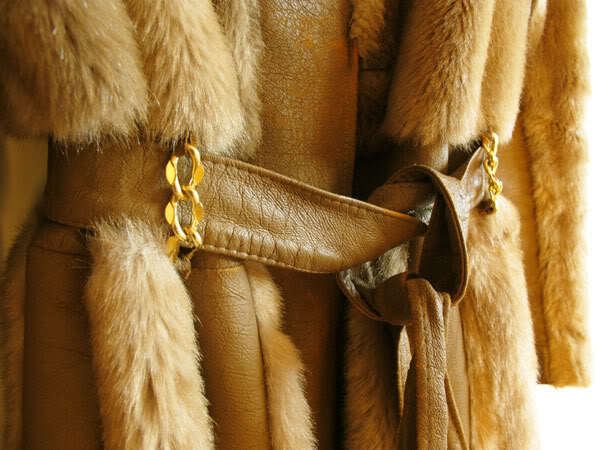 I love the gold chain belt loops and the exaggerated collar – it’s little details like these that make this coat so special. The tag read £45 but after a little bit of negotiating with the shop manager, I walked away £35 lighter with the coat tucked under my arm. Certainly not my cheapest second hand buy (in fact, it’s one of my most expensive), but still a complete bargain. And I can’t wait to wear it! Did you bag any bargains this weekend? Wow that’s absolutely gorgeous and so unique! I find it so annoying that when something is branded ‘vintage’ the price doubles! LOVE! 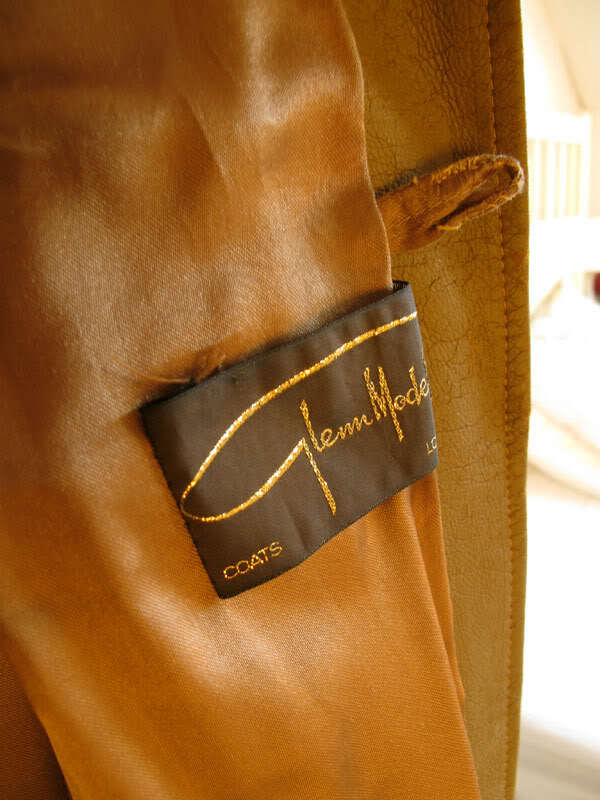 My favourite coat is a very similar shape, tan suede, with a huge faux fur collar – I think I paid £30 for it from a vintage shop. It now desperately needs cleaned, which is proving a major pain as the symbols inside are not the current ones so a couple of dry cleaners have said they won’t touch it. I suspect when I find one that will it will cost more than I paid for the coat in the first place. What a lucky find! 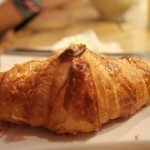 Also I was compelled to comment after (almost) spotting my blog title in the title of your post, ha! 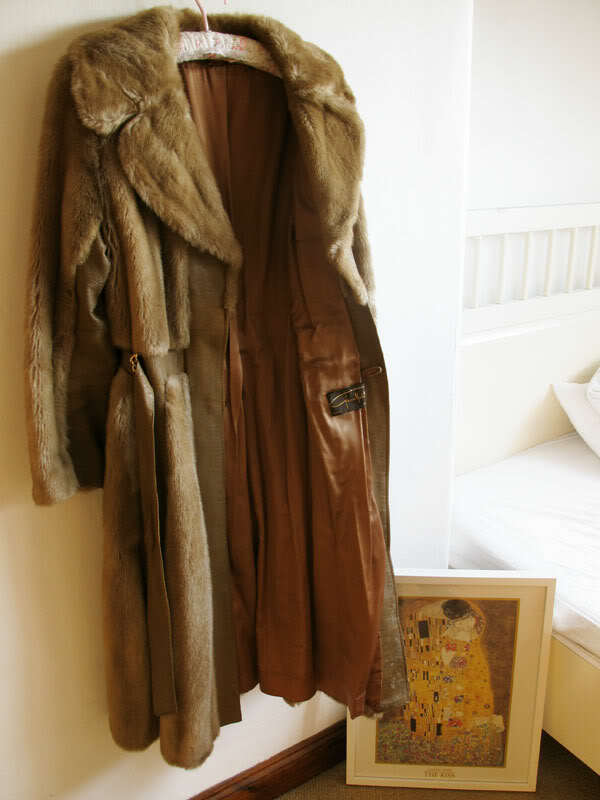 I went to some charity shops on a whim in the village where my bf lives and scored a gorgeous vintage brown faux fur coat for a tenner! It’s gorgeous 🙂 I love yours as well! Amazing coat! Bet you’re hoping for some real cold weather so you can wear it to it’s full potential now. I was at a ‘rail sale’ today, took along my worldly goods (not really, just the bags of clothes i’ve had stashed at the end of my bed for months), paid €30 for half a rail and sold the grand amount of….1 item. Devastated. Some of the people around me were charging extortionate amounts for designer and high street clobber. I was trying to do some nice, cheap deals, but no dice. There seemed to be more sellers than buyers, which ultimately was the downfall. A lot of people were giving out abotu the same. SO, I basically paid €20 to display my clothes on a rail in a hall. So disheartened. To eBay I go! you’re so right, if i place has stuck up the prices i’m pretty sure i will never bother returning. that coat is a really good find for you, worth paying extra than usual. i did in fact score a tweed two piece suit for £2. jacket fits perfect but the trousers need altering. Wow you really lucked out in that charity shop Jen! Lush! 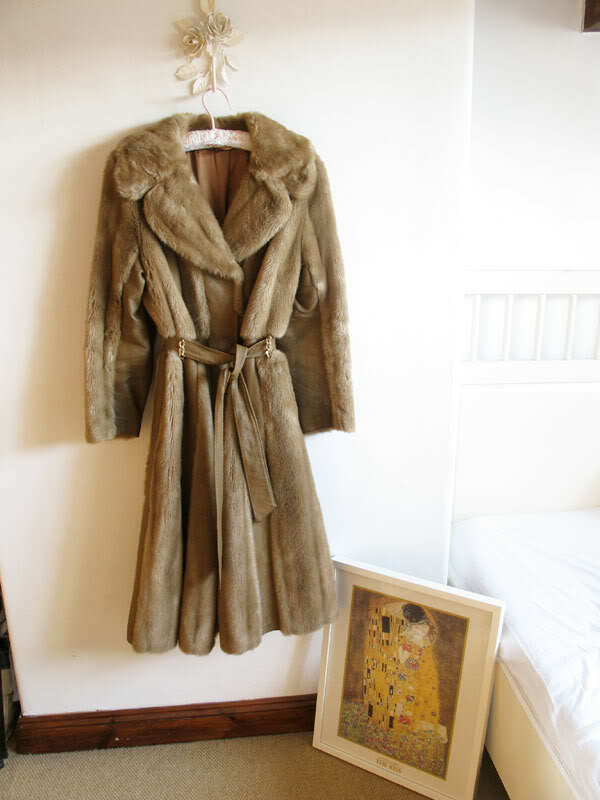 I recently bought a faux fur coat similar to your colour but unfortunately it’s not vintage. Great buy even at £35! Oh that is a bit special! Just goes to show that a bit of charity shop patience pays off in the end. I don’t mind paying £25-35 for proper quality vintage in good condition as I take the view if I’d pay that much for it in a High St shop it’s all ok. And people running vintage stores have a living to make after all so I don’t expect them to be charging buttons – they’ve done all the hard work finding the item and cleaning and repairing it. I *really* begrudge people passing modern stuff off as vintage though. ooft, what a beauty! i’ve never seen a faux fur before which is long & belted. & i’m definitely like you, i sell at vintage fairs but buy all my clothes from charity shops, so unless i really love something i stick to my charity shop bargains! That coat was will worth the price. I would have bought it too. And I totally agree when did thrift stuff become expensive? I mean really. When I was at my local goodwill looking at dresses thinking the same thing. Ooh, she’s a beauty :] Can’t wait to see what you’ll wear it with. Vintage stuff can be SO expensive, you’re right. I once went to a vintage stall at a Christmas market and there were tons of amazing Christmas jumpers but they were all about £25-30 each! Then on the other hand you can go to a charity shop and even though the jumpers will be hit and miss they’ll all be a couple of quid each. Ridiculous! I do hate overpriced vintage, especially when you can tell it is something picked up in a charity shop for pennies. Luckily in Liverpool there are some reasonable vintage shops, £15 for skirts, £20 for dresses. Like Alex said, if you’d pay that much for it in a high street shop why not a vintage shop? But of course getting a bargain is a great thrill! 😀 Can’t wait to see how you wear this coat. I definitely think that coat is a bargain – ifyou went to Zara for a similar one, it would be three times that much. I don’t begrudge paying the same kind of price as high street for a decent quality vintage piece – i’d still consider it a good deal as it’s a lot more unique. Gorgeous coat, great find in a charity shop! I followed a link on Temporary Secretary’s blog over here this morning and have been sat firmly on your blog since! Love the outfit posts and how unflowery (and by that I mean overly fash speaky) your posts are! What a gorgeous coat! Seriosuly to die for! Now,I totally agree with your thoughts on said Vintage fair, because I happen to know the one that comes to Nottingham was your way over the weekend, so must be the pop up fair you’re speaking of! Now, it has some lovely stuff, but none that I’d actually consider proper vintage, nor that cheap….and I’m not even a proper bargain shopper! Loving the blog’s little makeover, btw, looks lovely! I love your blog ! i have followed yours now darl ps : That coat is so lush ! What a gorgeous coat! Love the Klimt print too! Um Helen that’s a little uncalled for! Does that mean that every time I sell something on eBay instead of donating I’m doing the same? The fact that she uses charity shops should be cause for praise and it’s the best PR I’ve seen for trawling the charity shops in hope of finding vintage gems. Most people don’t bother and head straight for primark instead. Where, surprisingly noone offers to pay £10 more than needed! @Helen – totally uncalled for!! @Cupcakes and High Heels you do make some valid points ie. about PR. But as someone who works in a charity shop I find it irritating that people think they can barter in charity shops (where the proceeds go to a good cause) when they wouldn’t do the same in ANY other shop on the High Street) Nice coat though. Hi Helen, thanks very much for your comment. 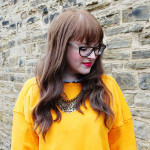 It really made me think, so I wrote a whole post about it – http://www.littlebirdfashion.com/2011/10/lets-discuss-haggling-at-charity-shops.html. Really hope you’ll share your thoughts there too, as I’d love to hear more opinions on this topic. PS – I really don’t think I can ‘barter’ in charity shops and have never asked for an offer before. I thought this item was overpriced so chatted to the manager (who I know through regular visits) about it, and she was happy to lower the price. I’m a regular second hand shopper and support lots of charity shops in my area, so don’t want you to think I’m some cheap haggler! In response to Helen’s comment, I have to point out that i have and would “haggle” or “barter” in a high street store, and have done so in the past with success, coming away with a less than perfect item at less than the asking price, and then fixing the faults.